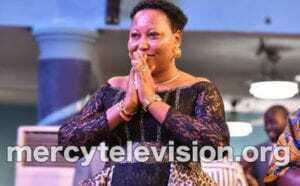 It was all joy in Mercy land Church, As renowned Prophet Jeremiah O. Fufeyin surprised his lovely wife with a cash gift of “Thirty Million Naira”. 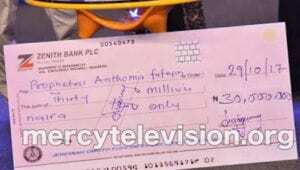 The wife who was in Awe couldn’t hide her joy as she was short of words when she was presented the Cheque of N30M. 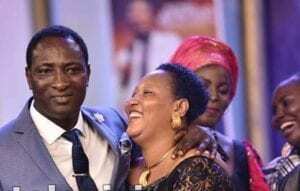 Below are pics gathered by the church media unit who posted a picture of the couple with a caption…..
“The Bible admonishes us in Ephesians 5:25 “Husbands Love your Wife even as Jesus Loves the Church” To demonstrate this Love for our Mama, Prophet Jeremiah O.